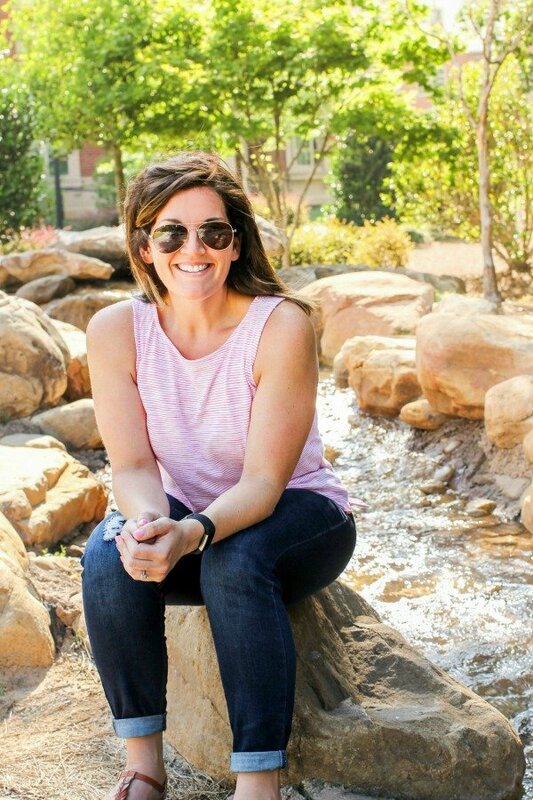 October 18, 2017 By Allyson 18 Comments This post may contain affiliate links. Read my disclosure policy. 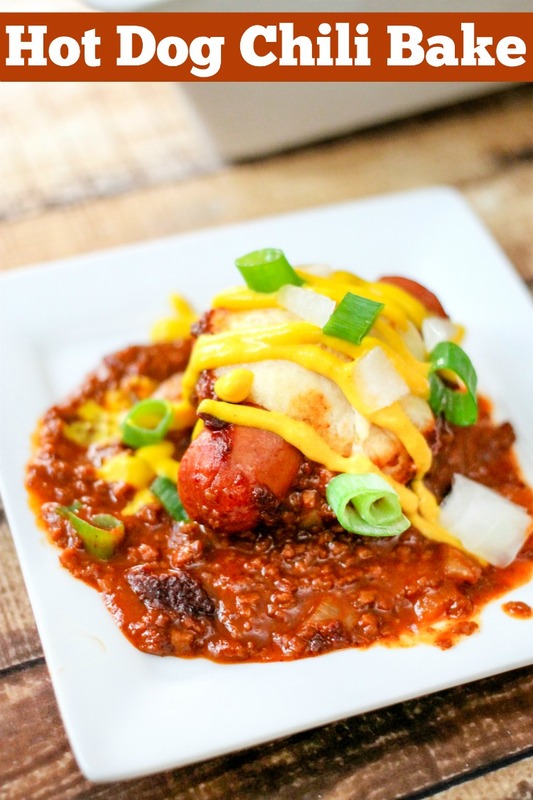 This Hot Dog Chili Bake is the perfect game day dish! 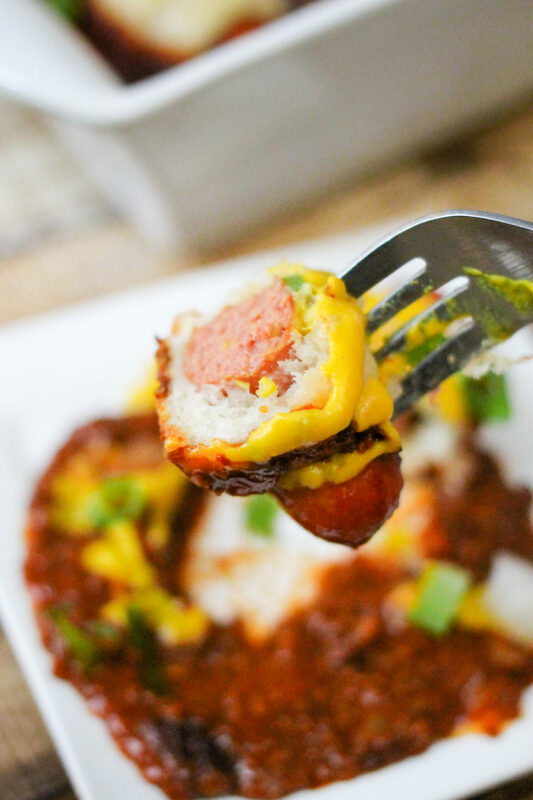 These crescent-wrapped hot dogs are dunked in chili then covered with your favorite toppings; everyone will devour this dish! When gearing up for weekend game days, I am always trying to think of the next best dish that everyone will love! 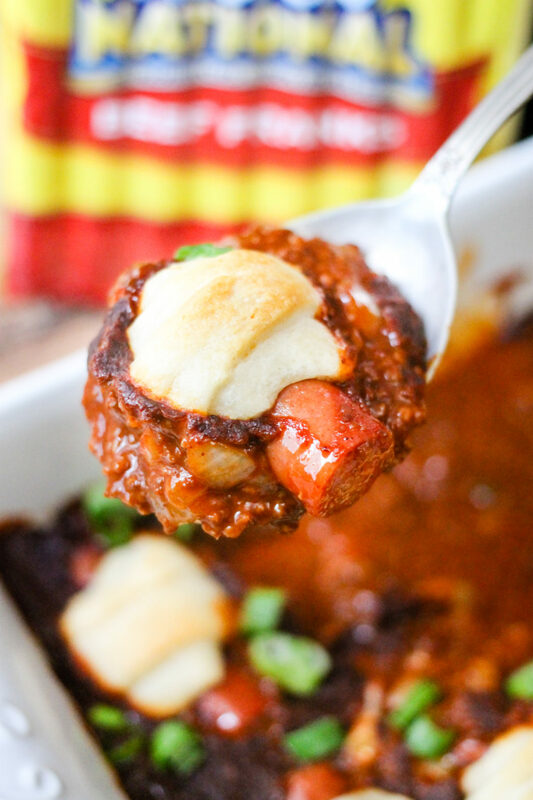 This Hot Dog Chili Bake has been a huge hit with friends and family, so I decided it’s time to share it with y’all! This is a sponsored post written by me on behalf of Hebrew National. As always, all opinions and text are all my own. 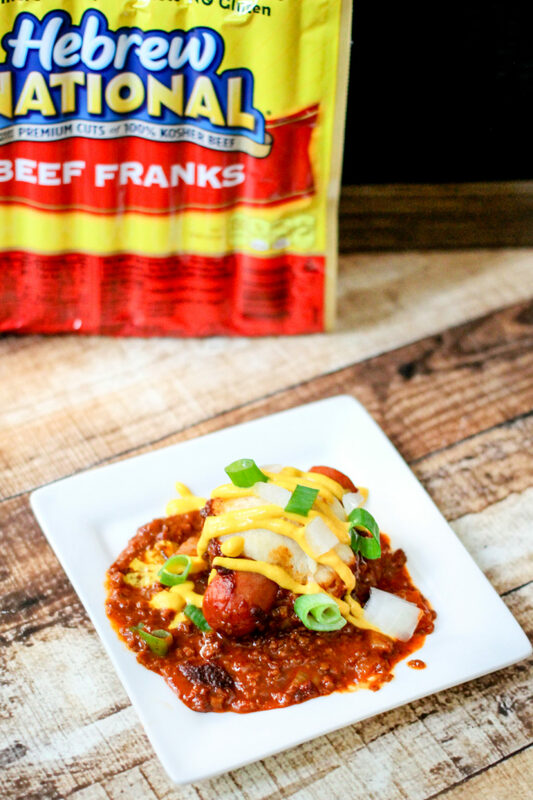 Not only is this Hot Dog Chili Bake delicious, but it is SO easy to make (see step by step recipe video below)! There are only a handful of ingredients and it takes only a few minutes to put together. Then you bake it up and you have a delicious hearty dish to serve to your friends and family. I like to serve the Hot Dog Chili Bake with a little condiment station as well (as you can see, I like mustard). That way people can choose their own toppings, because let’s face it, everyone loves different things on top of their hot dogs. I suggest onion, mustard, ketchup, relish or pickles, jalapeños (for those who like it spicy), and hot sauce. Those are some of my friend’s and family’s favorites! When I cook or serve hot dogs, I only ever use Hebrew National. Hebrew National hot dogs are premium quality, made with no fillers, which is important to me when it comes to hot dogs! They are made with 100% Kosher Beef and my kids and family love them! Hebrew National remains strict with their premium quality, so I don’t have anything to worry about and can focus on the more important things, like the big game! Preheat oven to 350 degrees. Taking a crescent roll, roll around the center of the hot dog; repeat for all hot dogs. Mix 3/4 of the chopped onion with the chili. Pour into baking dish. 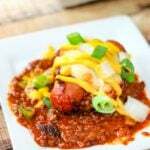 Place wrapped hot dogs into the chili in the baking dish leaving a little room between them. Cover with foil and bake for 20 minutes. Remove foil and bake for 15 more minutes or until chili is bubbling and the tops of the rolls are lightly browned. Remove from oven. Sprinkle green onions and remaining chopped yellow onions over the top. Serve and top with desired toppings such as mustard, ketchup, relish, etc. Enjoy! Looking for other great appetizers?! Check out all of my Appetizer recipes! Love this idea! 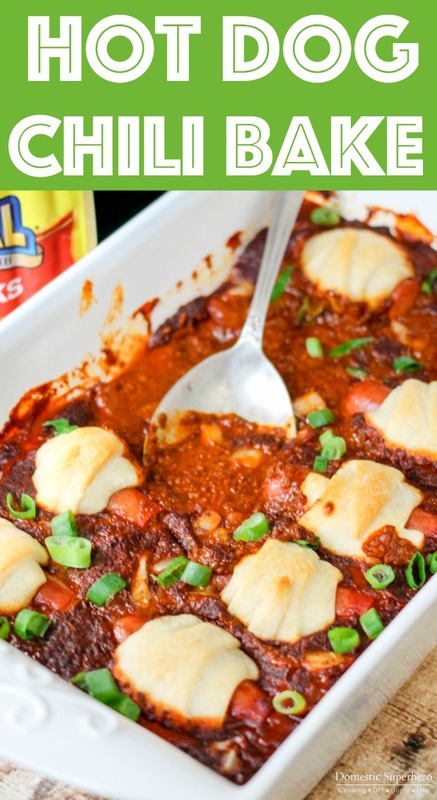 My family is going to love this hot dog chili bake! Let us know how they like it, Heather! My kids would love this easy dinner! Yum! Yes! Everyone will love it! I can see this quickly becoming a family favorite! Thank you!! Perfect quick and easy meal that I know my family will love! This is absolutely perfect for our game day gatherings — yum! What a fun, easy recipe! My kiddos would love this! Everyone will LOVE it for game day! This has game day written all over it! This looks awesome and so simple! I’m actually going to use vegan hot dogs because my family is vegetarian. 🙂 One question, what size pan did you use? Thanks. That would make a great substitute! Oh! I used a 9×13 baking dish! Such a great dinner idea- I love it! It sure is! Thanks, Jessica! Oh my goodness, my husband loves hot dog AND chili! This is would be a perfect easy midweek dinner for us. It really is a GREAT easy weeknight meal!